Isn’t it great when we can indulge before the big meal and still feel good? 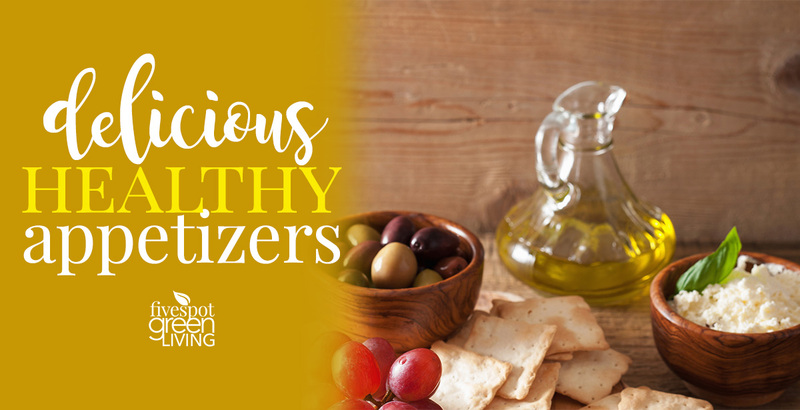 Healthy appetizers that also taste great are now the norm people! 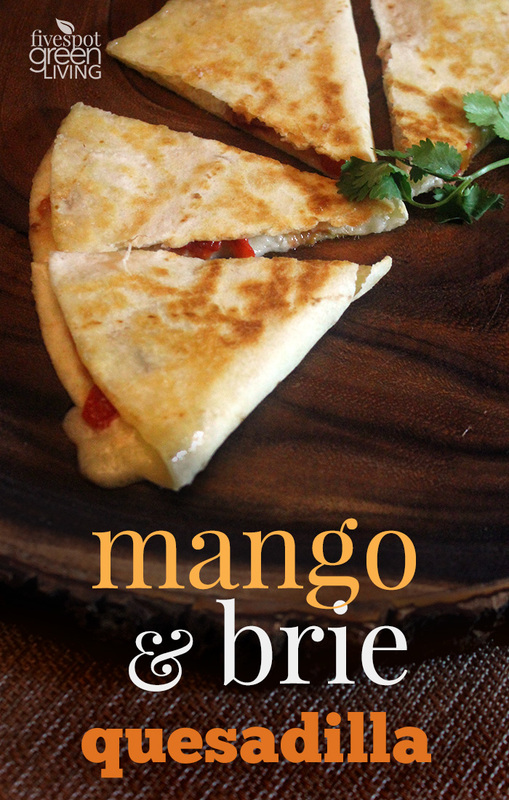 Try this Mango and Brie Quesadilla Healthy Appetizer for your next big meal or event! I made this for my family before dinner one night. It was barely cut before they inhaled it. I mean seriously they were like vultures. They even scraped the melted cheese off the frying pan. I guess this combination of roasted red peppers, mango salsa and melted brie cheese is too much to bear. It’s just SO good. All the flavors are so gentle and make such a delicious trio. This would make an amazing lunch with some grapes or apples on the side! Roasting the red peppers *almost* turned me off. But come on, folks – it’s so super easy! You just have to baste the peppers lightly in olive oil and put them under the broiler for maybe 15 minutes, turning them every few minutes. After that the skin falls right off. 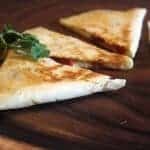 There are two ways to make these quesadillas. You can put the tortillas flat on a baking sheet lightly coated in oil and layer everything on top. Then fold the tortilla in half. You want the oil to be on the top and bottom of quesadilla for nice browning and also so it doesn’t dry out. Then bake until nice and browned on top and melty inside. OR – you can use a frying pan or skillet and lightly oil and then fry them one by one. 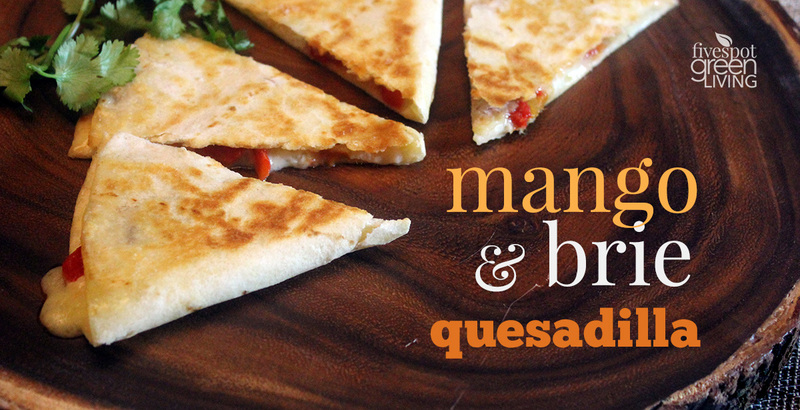 This is probably the easier way if you are making just one or two quesadillas. They are easier to flip this way. But for a crowd, you probably want to use the oven method. Brie is considered one of the world’s best cheeses. According to The Spruce, you should refrigerate Brie in its original packaging until you are ready to eat it. Then take it from the refrigerator and allow about an hour for the cheese to come to room temperature for the best flavor and texture. After you cut into a round of Brie, it begins to lose quality immediately. Plan to eat it within five days. When cutting, use a long, thin blade. You can serve the entire Brie on a plate or cheese board or cut just a few narrow slices for a sandwich or salad. Here's a wonderfully easy and quick healthy appetizer your guests or family will love! Wash the peppers and coat them in olive oil. Place on baking sheet about 3-4 inches under broiler. Turn as necessary, until all of the skin is black and peppers are bubbly. Remove and let sit for 20 minutes until cooled. Remove skin from peppers but do not rinse. This can remove some flavor. Cut off the tops, and remove the seeds and membranes from the peppers.Slice each pepper into 8 strips. Remove the rind from the brie and tear or slice into about 24 strips. Place as many tortillas that will evenly fit on baking sheet.Put 4 pieces of cheese on each half of tortilla, leaving the other half bare so you can fold it over. Top with 4 strips of the red pepper and 2 tablespoons of the salsa and a sprinkle of cilantro. 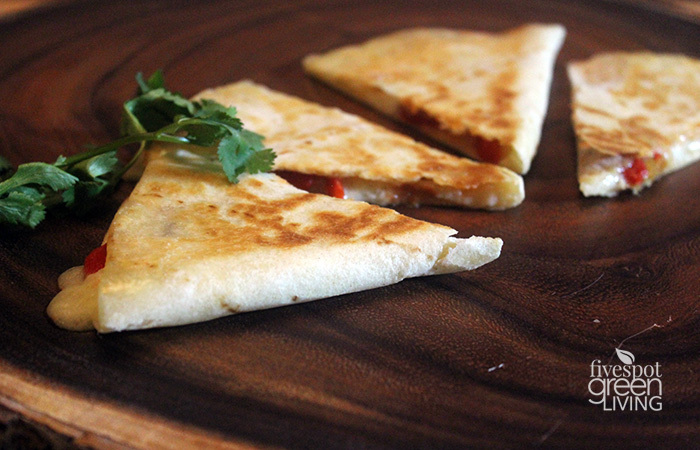 Put quesadillas under the broiler on low for 1 minute, then fold over tortilla on top of filling. Leave for 1 more minute then flip quesadilla. When the quesadillas are lightly browned and cheese is melted, remove from oven. Let cool then slice into small slices that can easily be picked up with your fingers. I love brie – this looks like a delicious way to serve it! Thanks for sharing at the What’s for Dinner party! I love brie! I need to make some! Thanks for the recipe! Thank you for sharing on Merry Monday! Hope to see ya next week! What a unique flavour combination – sounds tasty! What a great recipe! Do you usually make your own mango salsa, or do you buy a specific brand? We just moved to Costa Rica where mangoes are plentiful, so we’ve been making more homemade mango salsa that I’m sure would be amazing in this recipe! Wow Heather that sounds amazing! My kids love mangoes but they are hard to get in good ripe condition up here in new england! So, sadly, I did not make the salsa. I like to use Sabra brand fresh salsa – I think it’s the next best thing besides homemade! 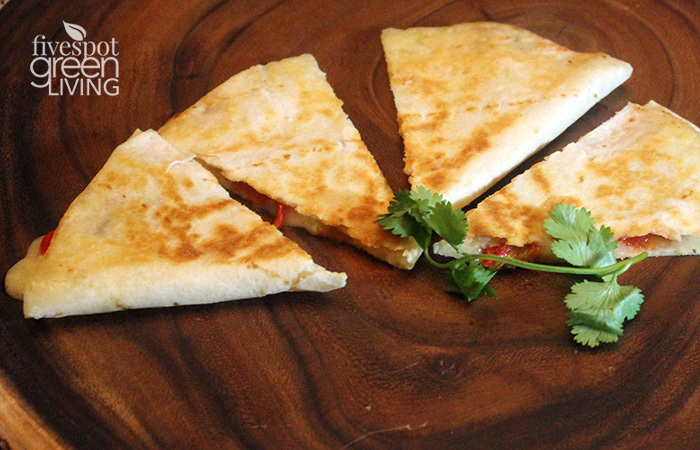 I can see why your family inhaled these quesadillas – mango salsa with brie and roasted peppers. I like to roast a bunch of peppers on my grill (the smell can be overwhelming sometimes) and then freeze them. Thanks for sharing your wonderful recipe with Fiesta Friday. I love this combination for a great appetizer! Hope you have a bountiful Thanksgiving and thanks so much for sharing with Full Plate Thursday! Great combination! These would be quickly devoured in my family as well. Thank you for bringing them to FF.